Growing Old With Einstein: The Long Wait For Detection Of Gravitational Waves : 13.7: Cosmos And Culture After many years, scientists say they have finally seen gravitational waves — giving Einstein a boost and opening up a whole new view of the universe, says astrophysicist Adam Frank. 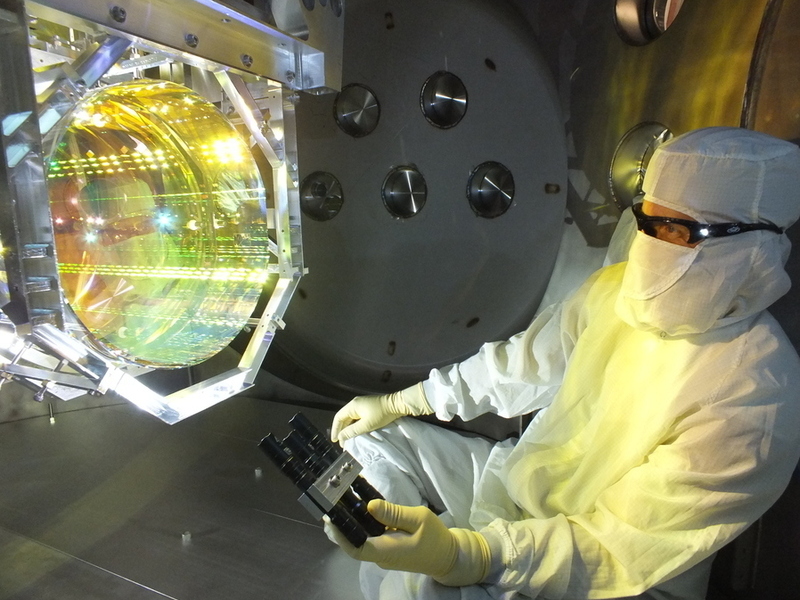 A LIGO optics technician inspects one of LIGO's core optics by illuminating its surface with light. It is critical to LIGO's operation that there is no contamination on any of its optical surfaces. 2002: I'm an assistant professor of astrophysics at the University of Rochester. Some guy comes and gives a talk about the two big gravitational wave telescopes now up-and-running in Washington and Louisiana. Sounds cool to me. Someone asks when we'll be able to see these waves. The guy says soon, if they're lucky. But there is a lot work that needs to be done calibrating the systems. It is a beautiful thing to find out I was wrong. But now, we are told, we can finally see gravitational waves directly. This is like someone who is blind to the color red — and all things red — suddenly waking up to a world with apples and roses and Valentine's Day cards. This would mean that, using LIGO as a gravitational wave telescope, we've just opened up an entirely new window on a universe of black holes, neutron stars and, perhaps, even the Big Bang itself. It's about patience and effort in the service of that most precious of human experiences: wonder. Today we can be proud to be part of a species that has gained such an understanding of the world. We can also be proud to be part of a nation that is willing to spend some of its hard earned treasure just to gain that understanding.